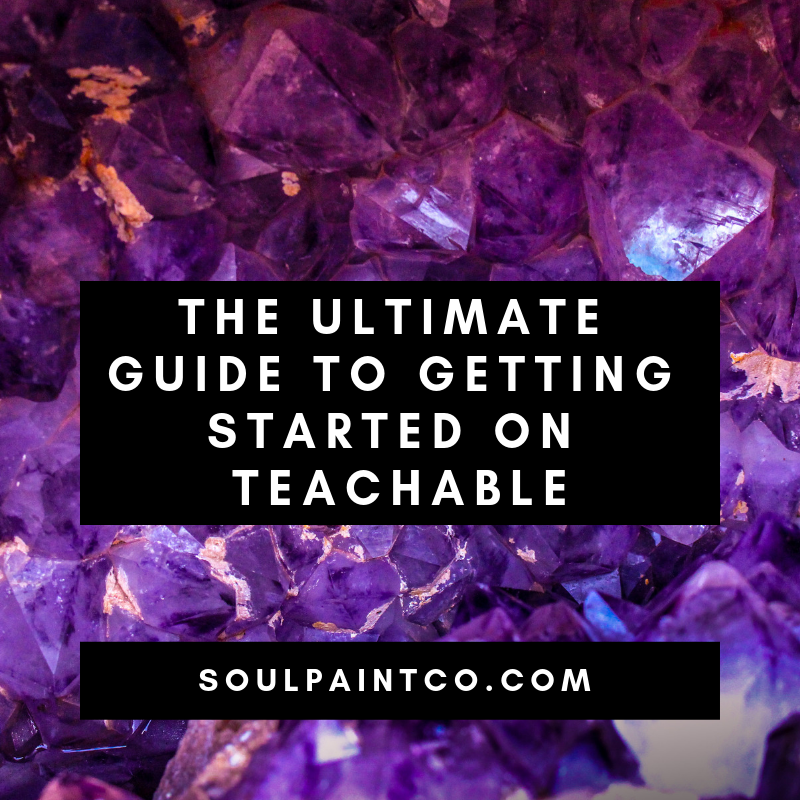 The Ultimate Guide to Getting Started on Teachable — Soul Paint Co.
1. Identify exactly who will be your buyer... Who are the people who are going to gravitate towards your course? Who are you going to be marketing to? Really get familiar with this audience and what they need and all of their pain points and the results that they are looking for. This is one of the most crucial steps when it comes to course creation, because if you don't identify exactly who you want to be marketing to, it's really hard to create a product that is perfect for them. You should know your potential clients like the back of your hand…. What are their likes? What are their dislikes? Also, give them a name and a personality so that, as you are marketing your course and creating it, you feel like you are speaking directly to them. 2. Do a big ol’ brain dump of all of the awesome things that you could teach. What are you really good at? What do people ask you how to do over and over? What are the problems that people come to you with? It's things like these that are going to help you craft a perfect course -- the things that you are great at that you can talk about over and over again. Now, let's talk about my favorite course creation platform - Teachable. I actually didn't start on Teachable. Originally I started on a different platform that was within WordPress and it was actually super hard for me to build an online course. And as you know, I like to do things that are easy, quick, and drag-and-drop; and I like all my clients to do the same thing. When I was building the “Bridging the Gap - Bringing your offline business ideas Online” course, I completely built it within Teachable and again, like I said, it was super easy. So if you are thinking about building an online course, I really encourage you to check out Teachable for all of the reasons that I'm going to list below. The first reason, of course, and I could say this a million times, is it is super easy! The framework is a piece of cake and you can literally pick it up in a day..actually, not even a day Let's be honest, you can pick this up in just a few minutes, because all of the modules that you create are drag-and-drop. So, you can get into your Teachable dashboard, decide what sections you want within your course, create that course outline and then decide what lectures are going to sit within each section, you can move around the lectures and you can move around the section. You're really not chained to any idea that you put into this course. You can delete, add, move...it's seriously that simple! The second reason that I love Teachable is because I'm coming from WordPress and I did a course on WordPress back in the day and it was really hard. It wasn't drag-and-drop and it wasn't easy to learn. In fact, it actually took me longer - probably three times the length of time - to create a course within WordPress than it did within this Teachable site. The learning curve in WordPress was huge. It wasn't easy; it was really annoying and although I did have students who enrolled in that course, it really wasn't easy to manage them. So with Teachable you can meet with your student and you can actually email them directly as well, which is super cool. And all of it is within your Teachable dashboard. The third reason why I love Teachable is because of the pricing structure. If you are new to business or you’re new to the online course creation world, you can actually create a course completely free. There are pricing options and there are upgrade options, of course, but if you're thinking, “Well, I just want to try this out…. you know, maybe I will like course creation or maybe I won’t”, you really don't have to make a huge commitment. You can create your first online course completely free and actually start selling it. Now, the difference is that Teachable does take a commission when you do that, but down the road you can always upgrade so that you pay a monthly fee and then they do not take a commission, so it's really kind of a “try it before you buy it” sort of deal, which is really neat. Let's talk about Sales pages. I'm not a pro when it comes to building Sales pages. Teachable actually makes it really fun to write a Sales page. I know….. who says that? Who says writing the sales page is fun? But it is as fun as it can be! Teachable does it so you can actually embed a video. Maybe it's a sales video or a promo video that you created. You can embed that onto your sales page; you can add a coupon Banner; you can add your entire course description; or add a bio of yourself. The entire course curriculum automatically gets added so your students can see exactly what is in your course. You can also add testimonials from past students and clients that you have worked with and you can also add a FAQ section where you can customize different questions that your students may have. And you can write the answer, so what this does is it allows you to identify any questions that potential students may have for you within this FAQ; and your conversion rates can actually improve by doing so. You can literally do all of this within the Sales Page Editor of Teachable. Super cool! Now, one of my favorite things that you can do within Teachable is to create a bundle. A bundle is basically when you create a course, or two or three or however many courses you have within your school, you can choose to bundle some of them together. That means, for example, if I wanted to bundle my Bridging the Gap course with my Convertkit Course, I can do that literally with a click of a button so that any student who purchases my Bridging the Gap course automatically gets my Convertkit Course completely free...how cool is that? Having the ability to bundle your courses in this way improves your income, improves your client reach, and can improve your Student Success. Ok, let's chat a minute about Drip Content. Drip Content means you have the option to have your students go through the course a week at a time, verses having the entire course available at once. This can work really well if you have a chunky course where if a student were to enroll in it and get everything at once, they would get totally overwhelmed. So having the ability to drip your content really helps your student success as well, because the last thing you want is for your students to get super overwhelmed or super stressed just looking at your lessons. You don’t want them to automatically think that they're going to fail because of all the content, so again having that drip option eases that overwhelming feeling for your students. Then you can actually sell a course that is not completely finished by offering the course with the drip function; maybe you have one, two or three lessons done and you're still working on the remainder, but you want to start generating income. You can sell this course and then have the content drip to your audience so while you're finishing the lessons that are down the road, you already have students in your course and you are already making money right now. We have talked a lot about the Teachable platform itself as far as how easy it is to use, it's very Drag and drop, but let's talk a bit about Integrations. I currently use Convertkit and previously I used MailChimp. The reason I changed is because Convertkit is so much easier to use. I actually have an entire course on how awesome it is and how you can use it too, but I love that Convertkit integrates really well with Teachable and it's seamless, which basically means whoever enrolls in my Teachable school my convert kid gets pinged and they get added to my email list, so I can follow up with my students within two weeks or months and see how they are doing and I don't actually need Convertkit to do this. I can email my clients and my students directly from the Teachable platform, but if you are like me and you like to grow your email list and have all of your clients and buyers and potential buyers in one place. You're going to love that you can integrate your Teachable with your email provider, whichever provider that may be. 1. Create courses - it’s really fun! I know you have a lot of knowledge in your brain that the world needs to hear! So having a course like this where you can continually sell in an easy platform where it's easy to build and market to your ideal audience, is amazing. 2. Choose a platform to create your online course that is easy for you to learn. I see so many entrepreneurs and so many clients who come to me saying “I know I need to do this, I know I need to do that, but I'm totally stuck on the techy side of how to make my ideas happen”. Again, Teachable is super easy and you do not have to be tech-savy to do it. All you have to do is get in there and start outlining your course! Have you tried teachable yet? What are your thoughts?